Inspired by the Pokémon Go hype that’s been around these days, at Sparsity felt like sharing with you an application of graph technologies to catch’em all. We will show you how to use a graph database like Sparksee in conjunction with a document-oriented NoSQL database like MongoDB to find the best Pokémon for a battle depending on your opponent. Remember that you can download Sparksee for free and use it in your own project. Let’s start with a little Pokémon background, although odds are that if you are reading this, you won’t need it at all. All Pokémon creatures and their moves are assigned to a certain type . From generation 1 to 6, the latter being the most recent Pokémon generation in production, there are 18 of those types. 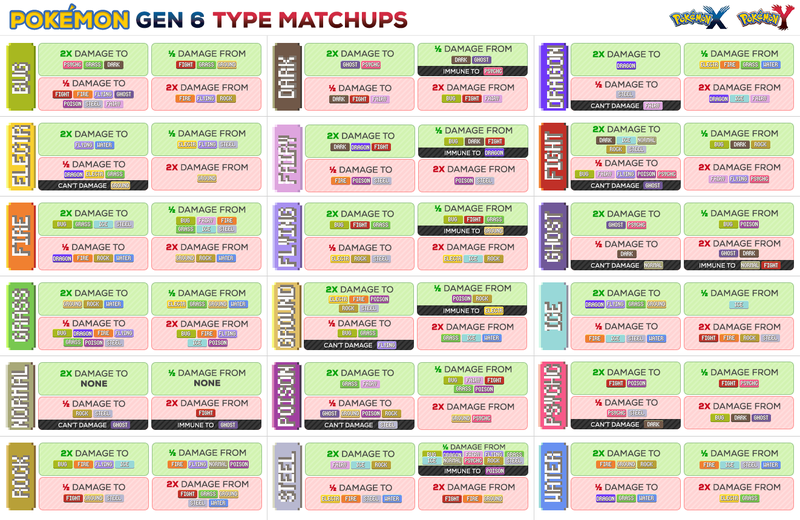 Each type has strengths and weaknesses when facing other Pokémon in battle. These can be grouped into 5 different relationships that define how effective will a creature’s defence or attack be. As we are conceiving the graph as a whole, we should simplify the relationships as they are different sides of the same coin. To match the visualisation of the edge direction with the meaning of its label, we will use the “inflicts” relationship. To create the graphical representation of the graph we used a table by Sheri-B. We created two subgraphs to simplify its visualisation –one of them highlighting the positive relationship types (edges called inflictsx2) and the other one the negative relationship types (inflictshalf and nodamage edges). * This is a pseudo-code check your language of preference at the Sparksee reference guide for the exact neighbors and interseaction operation signature. To better understand the process, let’s have a look to an example where the Pokémon we have to fight is Pikachu. Which type is Pikachu? Answer → Electric. Call the Sparksee Catchemall function with T1 == Electric. Answer → The function returns the Object type Ground because this type inflicts 2x damage to Electric and Electric attacks have no effect on Ground. Thus, this is the best option possible, our algorithm would stop at the first return. Which Pokémons are of type Ground? Answer → list of Ground Pokémon. If you have one of them, Lucky! Chances are that you will be the winner. Graphical representation of the example. There are more variables to be taken into consideration in a battle, such as the level, the secondary type or the attacks your Pokémon learnt, but for simplicity we are considering only the type of Pokémon. Optionally you can represent Pokémons as a new type of node and add a belong edge to relate them to the type of Pokémon. This entry was posted in News, Sparksee, Use Case and tagged graph database, MongoDB, PokemonGo, use case. Bookmark the permalink.